Most of these long zippers were purchased for special projects. So the lengths might not fit for your special project. 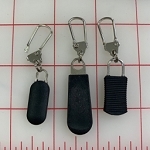 These zippers are easily shortened by using top stops & your needle nose pliers. 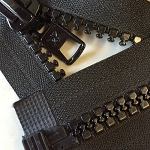 If you want to reduce bulk after shortening one of these zippers, just nip off the excess teeth that are going into the seam above the top stop. Bright Orange #5 Coil: 26 & 30"
#5 Molded 2-way - 26-46"
Olive 2-way Sep Coil - 46"
WHITE Coil #3 - 110"
Longarm Leader Zippers - 114" & 134"